Good Garage Scheme Car Servicing in Great Britain : Good Garage Scheme member launches the UK's first Apple iPhone application of its kind! 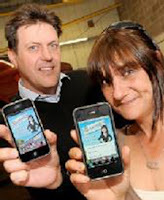 Good Garage Scheme member launches the UK's first Apple iPhone application of its kind! 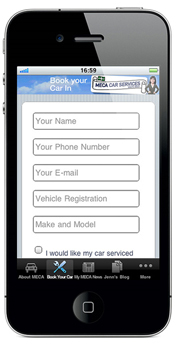 Jennifer Riach, of MECA Car Services, a long-standing member of the Good Garage Scheme, has launched an iPhone App for her garage. 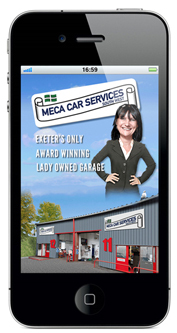 The app was created to give Exeter’s only female-owned award-winning garage’s customers an easier way to book their cars into the garage or contact them direct from their phone. 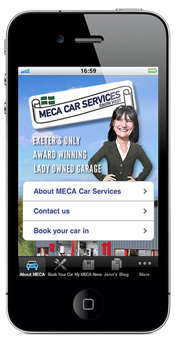 MECA Car Services are understood to be the UK’s first garage to have an iPhone App developed, courtesy of Rokk Media in Exeter. 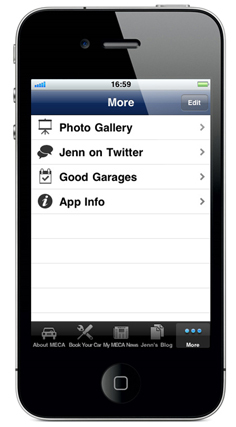 The new iPhone app provides a number of features including information about the garage and links to their Twitter updates plus the blogs of both Jennifer Riach and the Good Garage Scheme. Their website was redesigned recently and an iPhone app was seen as another resource for customers to make contact with the garage. The “My MECA” App can be downloaded directly to an iPhone from the iTunes App store or online here. The Good Garage Scheme's own iPhone app can also be downloaded directly to an iPhone from iTunes App store or online here. I like your app a lot! I like your app very much!